We have created this blog to house posts on our knowledge, thoughts and observations of the luxury lifestyles and diverse cultures of Mauritius, Seychelles. Madagascar, Zanzibar, Maldives and Sri Lanka. Enter your email address to follow our blog and receive regular updates of our posts by email. Reflecting on 2012 we have seen some interesting developments. Whilst there are still some firm favourites making the top 10 we have seen a large increase in family groups looking for a traditional yet trendy villa holiday. This year has been hugely successful for several of the villas on this trend in Mauritius. These spacious architect-designed pool villas with often 5+ bedrooms, offer a real home from home with their own local staff to take away those domestic chores. 2012 has also seen the opening of more luxury oceanfront apartments with very positive client feedback. Wedding parties blocking whole complexes were very popular this year, especially for those with guests from the southern and northern hemispheres meeting half way. Mauritius continues to attract the villa client who can enjoy a tropical home from home, with homemade cooking, hot sandy beaches and the usual warm welcome of the Mauritius people. Cape Point is a fantastic seafront property in North Mauritius just 5 minutes from Grand Bay. This year has seen a flurry of wedding groups with guests from all around the globe. Weddings can be held at Cape Point or at other romantic locations nearby. Cape Point has four spacious 3 bedroom apartments and a 4 bedroom penthouse offering a high level of comfort and stunning views over the lagoon and the northern islands. The swimming pool has a large wooden decking area and a pool bar. Leora opened late 2011 and was the first luxury apartments for rental on the west coast. An instant hit with our guests, it will soon be joined in April 2013 by another similar property L’Espanade. Leora Beachfront Apartments are in a stunning location with amazing sea views. There are 12 apartments and 2 penthouses of 3 bedrooms each set in four stylish blocks. Nearby are top-rated golf courses, sports clubs and commercial centres with shops and restaurants. The opening of such apartments are ideal for families, couples and groups of friends. As always, Villa Athénée is a firm favourite every year, this 5 bedroom beachfront thatched villa is traditonal yet stylish. A real home from home, the guests appreciate the ambiance of the villa, deck, pool and lovely soft sand of the beach as well as the delicious cooking provided by Marie-Josee. Excellent choice for a group of friends or large family. One of our favourites and with fantastic staff, this villa brings family and golfing groups back year after year. Villas Hermes 2 with its 5 bedrooms can be rented along with Villa Hermes 1 with 4 bedrooms. A much sought-after villa which shares the finest beach of Belle Mare with the One&Only St Géran. All bedrooms are en-suite and air-conditioned. The outside covered terrace leads to a spacious lawn overlooking the powder beach and quiet bay. In our opinion you can’t beat both its location and its dedicated staff . A truly authentic Mauritius holiday experience. On a gorgeous sandy beach, this well positioned 4-bedroom villa with a guest cottage sleeps up to 8 adults and 2 children. Days are spent sunbathing in the beautifully maintained front garden, laid out lawn and sand or dining under the covered wooden gazebo overlooking the stunning bay. Its location is great for sea sports enthusiasts with the Blue Water Diving Centre and the Big Game Fishing Centre just 75 metres away. This villa has been very popular for large family groups with small children. This brand new exclusive villa lies on the beach overlooking the islands off the North coast. It is designed in tropical contemporary style and consists of 4 air-conditioned and ventilated en suite bedrooms sleeping up to 8 guests. Located in the south west of Mauritius at Bel Ombre is Domaine de Belle Riviere, one of the most exclusive estates in Mauritius comprising some exclusive luxury private villas and the Sofitel So Mauritius five star luxurious hotel and spa. Villa Thalie has 7 bedrooms (4 suites and 3 doubles) and can sleep up to 18. Excellently managed and with complimentary access to the neighbouring Sofitel So Mauritius beach, kids club, restaurants and spa this has been a big hit with our discerning family groups. Ideal location for a very private and sophisticated wedding. A traditional thatched and stone villa with pool and a very attentive housekeeper and cook. With 4 bedrooms Villa d’Eden offers a comfortable relaxing stay whether as a couple or with the family. A popular favourite this beautiful 4-bedroom villa is situated in a tropical garden overlooking the tranquil beach of Roches Noires, in a cove well protected from the wind. It is the ideal location for sports lovers who want to kite surf, use championship golf courses and jog along the coast. Ideal for families sleeping 6 adults and 2 children. Ideal for golfing groups and family get togethers, Lunea Villas are nestled in the heart of a 213 acre estate of Anahita with views across to the famous Ile aux Cerfs. The estate also includes the Four Seasons Resort Mauritius and the 18 hole Championship golf course designed by Ernie Els. Hope you’ve had a wonderful year in 2012, we know we have with the Olympics and Paralympics in the United Kingdom to be excited about amongst all the rest that is happening in Mauritius. We look forward to welcoming you to some of these beautiful locations in 2013 which is already just round the corner! Seychelles is such a beautiful destination; an archipelago of 115 islands in the Indian Ocean. Luxury villas are rare and we have searched for many years for the perfect properties. Unlike Mauritius the properties in Seychelles tend to be built on the hillsides with magnificent views of the ocean and are just a short ride down to world class beaches. On Praslin we highlight two properties Villa Castello which is beachfront and Rocky Bay Villa which is oceanfront. The standard of some of the Mahe properties makes them a delightful alternative to the hotel stay. All villas are staffed and some villas come with a butler and full board options. Eden Island is our latest addition which offers the boating enthusiast a luxury apartment or maison with the quay only a few steps away. We hope you enjoy our selection. Li-al-do Maison is a beautiful 4-bedroom villa surrounded by a luxuriant tropical garden with its stunning swimming pool and gazebo overlooking the unspoilt bay of Takamaka, on the south-west coast of Mahé, the largest of the Seychelles islands. The architecture of the villa is very much in keeping with the unspoilt surroundings with its decorations and furniture handcrafted by local craftsmen. It is a great villa for a family reunion or a group of friends with wonderful staff to help you enjoy your stay. The beach is within 10 minutes and many sea excursions are on offer. Perched in a luxuriant forest overlooking the palm-fringed coral beach and turquoise lagoon of Intendance Bay, South of Mahé, lies Residence On the Rocks. This retreat whose architectural design, as well as interior décor, evokes a sumptuous plantation house from Seychelles’ French and British colonial eras. The villa consists of a two-bedroom Main House on more or less level ground with granite/rock formations on either side for privacy, a one-bedroom Guest House and a fourth suite has just been added. The large infinity pool (10 x 7 m) elevated just below the rock formations offers a vertiginous ocean view. Opposite the Guest House, a gazebo used for alfresco dining, massages and spa treatments sits on a granite rock. A large Jacuzzi nestles in a rock cave next to it. Situated at the northern end of Mahé in the Seychelles, this stunning four bedroom villa is impeccably appointed with a unique blend of contemporary European and traditional Creole styles. Set within a private tropical garden with palm, frangipani and fruit trees the villa also offers an infinity swimming pool and sunbathing areas, with stunning views of Beau Vallon Bay and the Indian Ocean. A staff apartment is also available. It is rented fully staffed with breakfast and the possibility of full board option. Eden Island is the perfect location from which you can explore the true beauty and treasures that these magnificent islands have to offer. Situated just off the mainland of Mahe; The Eden Island Marina development is the Seychelles’ Ultimate 5 star self catering resort. Eden Island is a residential marina development featuring a range of beautifully designed luxury Apartments, spacious Maisons and private Villas offering 5-star self catering accommodation. A bridge connects Eden Island to the main island, where the international airport is a mere 10-minutes drive away. The Eden Island Apartments are luxuriously designed to fit with the ideal of island living. Ranging from 88m2 to 215 m2, they are typical one to three bedroom apartments, featuring wide open spaces, big open doors and large windows with extended covered verandas, inviting the beautiful outside in. Spaced all around the island in apartment blocks not higher than two stories, each apartment comes standard with Miele appliances – washing machine, dryer, oven and hob, a dish washer and of course a refrigerator. Maisons are private and Luxurious duplex homes featuring plenty of space and consist of two to four bedrooms. They range in size from 210m2 to 305 m2. As with the Apartments, the Maisons come standard with en-suite bathrooms. Placed privately on plots ranging between 260m2 and 1000m2, no more than 3 Maisons are connected to each other, facing different directions to optimise privacy and bringing the extensive outdoors inside through large verandas and open windows. This distinguished Tuscan-style property is located on the north-western section of the island of Praslin with the most impressive sunsets on the island. The property is nestled on one of the most beautiful white powder-sand beaches of the Seychelles with excellent opportunities for swimming and bathing. It presents a fascinating view onto the islands of Cousin and Cousine as well as Mahé and Silhouette. From the Beach Pavillon you can look over both offshore beaches and a breathtaking outlook onto the sea. It is Four double bedrooms with 3 bathrooms. It has a wonderful private swimming pool and a fantastic beach location. It is also within proximity of Castello Beach Hotel for dining and activities. Bay View Villa is on the most beautiful coast of South West Mahe between the Barbarons tip and the Anse Boileau Bay, ocean front and in an oasis of calm and greenery. It is 20 minutes from the capital city Victoria and 25 minutes from the international airport by car. There are a few shops and restaurants some 10 minutes from the villa on foot, and the only equestrian centre in Mahe is also nearby. Nestling against this unique backdrop and commanding sublime views of the coastline of east Mahé, Villa de Cerf provides luxury and privacy in an exquisite island retreat that boasts four spacious, elegantly-furnished rooms on two floors of an imposing, colonial-style villa not far from the water’s edge. Among further villa facilities are a spacious lounge/dining room and swimming-pool with wide terrace and sun deck while the services of a live-in hostess and cook are available to ensure maximum guest comfort and the best possible introduction to mouth-watering Seychellois Creole cuisine. Cerf Island, part of the beautiful Ste. Anne Marine Park, is close to the scenic east cost of Mahé, the principal island of the Seychelles archipelago, and offers one of the most tranquil and unique landscapes of all the Inner Islands. Having long been the traditional settlement of choice for the privileged few, Cerf Island gives its residents a refined ambience as well as all the benefits of fine island living: silver-sand beaches, hidden coves and a pristine interior just waiting to be discovered. Rocky Bay is a luxurious villa perched ten meters above water and overlooking the picturesque sandy bay of Anse La Blague in Praslin. Its peaceful and unique location on a private rocky headland has breathtaking views and its close vicinity to the sea makes it a highly sought after holiday environment. The villa offers four double bedrooms with double beds and with their own private balcony and sea views. The villa comes with housekeeping and a chef. A rental car is recommended. This is a great villa for a family holiday and children under 12 stay free. The villa rental comes with housekeeping and chef. The Royal Bay Villa is situated towards the southern part of Mahé Island. 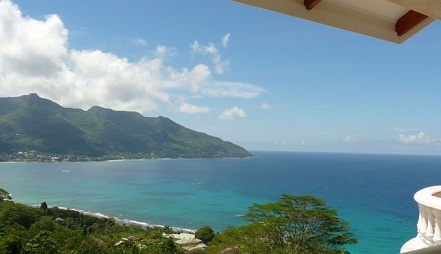 It overlooks the beautiful bay of Anse Royale and its magnificent beach (2 minutes walk). two of which with double beds are en suite whilst the other two (1 double & 1 twin) share a large bathroom. All rooms are air-conditioned and have their own external balcony and most bedrooms also offer views of the ocean. Great villa for a family holiday and children under 12 stay free. Villa rental comes with housekeeping and chef. The villas are located on Silhouette Island (a marine national park, that is regarded as one of the most important biodiversity sanctuaries of the Indian Ocean), 30 kilometers from Mahe, the main island where the international airport is situated. A 40 minute boat ride or a short helicopter flight from the main island of Mahe, Silhouette island is known for its dramatic mountain peaks, rich cultural heritage and unique biodiversity. Only steps from the idyllic palm fringed beach, all of the stunning Villas at The Hilton Seychelles Labriz Resort & Spa Resort offer spectacular views, luxury amenities, wireless internet access and spacious living areas. Various villa types (some with plunge pools) offer great accommodation for couples and families of 2 adults and 2 children. There are also plenty of activities with a fitness centre, PADI dive centre, spa and a total of 7 restaurants. We hope you have enjoyed our Top 10 and look forward to your feedback! Reflecting on this year we have seen new trends and wanted to share with you our portfolio’s top 10 Mauritius villas and apartments for rental in 2011. A hugely successful trend in Mauritius for accommodation is the wide range of brand new luxury beach apartments and penthouses on offer. These beachfront properties are making a refreshing change to the hotel and also enhancing to the Mauritius experience by enabling guests to live like a local and get outside the tourist zones. All the apartments are newly built, privately owned and managed by professional teams for housekeeping, security and concierge. This year has seen the opening of such apartments each corner of Mauritius and the uptake has been beyond our expectation and the feedback is positive. The guests appreciate the privacy, style and service whether on holiday with the family, business trip or an extended stay. This year has also seen the opening of many top luxury private villas with chefs, butlers and maids and the uptake has been excellent. Some beachfront villas are newly built by private owners, some are boutique villas run like small luxury hotels fully staffed and others are substantial investment properties on private estates. All offer a home from home top class stay whether you are a group of friends, private wedding party, large family holiday or a corporate retreat. Cape Point has four spacious 3 bedroom apartments and the second floor 4 bedroom offering a high level of comfort and stunning views over the lagoon with the small outer island of Coin de Mire. The swimming pool has a large wooden decking area and a bar pool. Cape Point is located in the exclusive and quiet area of Cap Malheureux and is only five minutes away from the bustling resort of Grand Bay. This property has been a great success for large family reunions and weddings. Brand new for 2011 these first luxury apartments for rental on the west coast were a hit from the moment they were launched in July. Leora Beachfront Apartments are in a stunning location with amazing sea views and private access to the sea within a stylish setting. There are 12 apartments and 2 penthouses of 3 bedrooms each set in four stylish blocks. Nearby are top-rated golf courses, sports clubs and commercial centres with shops and restaurants. The opening of such apartments in other seaside locations is a welcome addition to what the island offers as they offer privacy, style and service required by many clients coming to Mauritius on business or for an extended stay. It is also ideal for families, groups of friends and small corporate groups looking for an alternative to the luxury resorts. A firm favourite year on year, this 5 bedroom beachfront pool villa is stylish and spacious; a real home from home. Guests appreciate the ambience of the villa, deck, pool and lovely soft sand of the beach as well as the delicious cooking provided by Marie-Josee. Excellent choice for a group of friends or large family. Villas Hermes 2 with its 5 bedrooms can be rented along with Villa Hermes 1 with 4 bedrooms. A popular villa on the finest beach of Belle Mare and right near One&Only St Geran. All bedrooms are ensuite and air-conditioned. The outside covered terrace leads to a spacious lawn overlooking the powder beach and quiet bay. Great for families with small children as well as groups of friends. Well located near several top golf courses and 5 star hotels these villas are a long time favourite of our clients. The staff show a love and dedication in their housekeeping and cooking and offer a truly authentic Mauritius holiday experience. sleeps up to 8 adults and 2 children and boasts a beautifully maintained front garden, laid out to lawn and sand, leading to a covered wooden gazebo for dining and overlooking the beach and beautiful blue bay of Mont Choisy. Its location its great for sea sports enthusiasts with the Blue Water Diving Centre and the Big Game Fishing Centre (Le Corsaire )just 75 metres away. This villa has been very popular for large family groups with small children. Built along the beach of a large family estate off the beaten track on this fabulous peninsula close to Black River and Le Morne, these stylish villas ticked all the boxes. With 3 bedrooms, spacious beachfront private pool, on a lovely beach and with great homemade Mauritius cooking. Stunning beachfront Villa Tiara has welcomed many of our guests this year. A luxury stay in this boutique villa is with service chef, butler, housekeeping 24/7, own private heated pool, hamman/sauna and gym. The villa can accommodate 12 adults and additional children. It can be rented on bed and breakfast, half board and all inclusive. Along with sister Villa Almira the Sankhara villas can accommodate up to 18 adults plus 6 additional beds. A popular 3 bedroom all ensuite villa with own private pool. A pampered stay for all the guests with butler, chef and housekeeping. Family groups, golf groups, large private weddings and corporate retreats have enjoyed both Villa Tiara and Villa Almira this year. Beautifully spacious 1,2 and 3 luxury bedroom suites/apartments with breathtaking views of the turquoise lagoon or views of the lush golf course with a stunning mountain backdrop. Superb breakfasts, many complimentary activities and top class restaurants. Well equipped gym, variety of sports activities and a relaxing spa. OurSpace children’s club and Teen’s club. The Anahita Golf Course benefits in as many ways as possible from its beautiful, natural setting. You have spectacular rocky outcrops, large native trees and jaw-dropping views of the mountains and Indian Ocean. With the offers available at Anahita and the huge range of top level facilities we are always happy to recommend the resort to our clients. Open this year for rental these spacious 2,3 and 4 bedroom villas overlooking the ocean and the 18 hole golf course of Bel Ombre. Guests staying here have relaxed and been spoilt. Whether golfers or not there has been plenty to do with free access to the C Beach Club, restaurants, bars, spa and sports facilities of hotels, Heritage Le Telfair Golf & Spa and Heritage Awali Golf & Spa. Elegant Destinations Hotels, Villas and Apartments in Mauritius, Seychelles, Mozambique and Zanzibar.